This is an unabashedly inspiring drama that really delivers on that level without ever seeming cloyingly sentimental. Based on John Carlin’s book “Playing the Enemy,” it focuses on South African President Nelson Mandela (Morgan Freeman) and his support of the mostly white (except for one player) Springboks rugby team as a way of uniting a racially-divided nation in the wake of apartheid in 1995. Freeman – who also executive produced -- is superb in his portrayal, perfectly capturing the leader’s cadences and dignified demeanor. Just released from 27 years in prison, Mandela assumes the presidency with a largely white staff from former President de Klerk’s regime anxiously fearing they’ll be given the axe. Much to their surprise, all he asks of them is their support. In the same spirit, he persuades the incredulous black National Sports Council to accept the Springboks – heretofore, a symbol of apartheid -- as the national team for the good of the country. "They are our partners,” he argues, a strategy that pays off beautifully. The title, by the way, derives from William Ernest Henley’s famous poem (“I am the master of my fate; I am the captain of my soul“) that gave Mandela solace when in his jail cell. 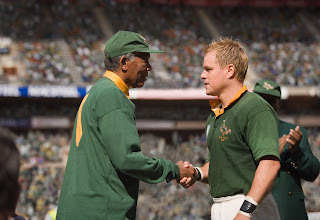 Matt Damon is Francois Pienaar, the Springboks captain who is summoned by Mandela who proposes that the team – thus far, on a losing streak – make a play for the World Cup. They men forge a respectful alliance. 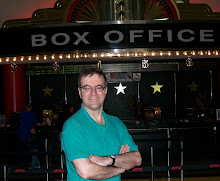 Damon’s South African accent sounds impressively authentic and he gives an admirably unshowy performance. Clint Eastwood has directed the epic moments – mostly the teeming stadium scenes – as confidently as the intimate ones. The climactic World Cup rugby match is superlatively done, if a little protracted. There are some wonderful moments throughout: Mandela conscientiously learning the names of the Springboks players so he can address them on that level; the team co-opted into playing with black school children, and then having a genuinely good time; and, reflecting Mandela’s philosophy in microcosm, the growing respect between Mandela’s wary African National Congress black security detail (Tony Kgoroge and Patrick Mofokeng), and the Special Branch white agents (Matt Stern and Julian Lewis Jones) with whom Mandela insists they work. There are good performances from Adjoa Andoh as Mandela’s chief of staff, and Marguerite Wheatley as his fiancé Nerine, both of whom are skeptical of Mandela throwing himself into the rugby stakes with so many other pressing issues. This is, for the most part, a restrained drama – so much so that Anthony Peckham’s script twice adds false tension by making us think Mandela’s life is in serious danger – but the central portrait of this extraordinarily forgiving leader wisely contriving, and succeeding brilliantly, in bringing reconciliation to a divided populace with the motto “One team, one country” is absorbing enough without the red herrings.